Hurricanes are such powerful forces that we often anthropomorphize them, we think of them as being conscious beings. One sign of this is that we name them. We talk about where they ‘want’ to go and what their ‘intentions’ are. 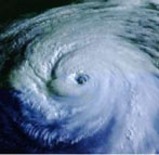 And perhaps nothing is more mysterious, tantalizing and intriguing than the ‘eye’ of the hurricane. If the hurricane were a conscious being, the seat of its consciousness would surely be within the calm center of the eye. Indeed, there is a long history of equating the ‘eye’ with the ‘I’. The eye is the thing through which you perceive in the act of looking, though you never see the eye itself as you do so. The ‘I’ is the unifying force through which experiences are held together as ‘my’ experiences, though you never get to experience the ‘I’ itself as you do so. But, in fact, hurricanes are the very opposite of intentional beings. A hurricane is simply the outcome of various inputs. The wind is blowing at such and such velocity. The temperature of the ocean water is at such and such degrees. The atmospheric conditions are having this or that effect. Ultimately, like any other force of nature, hurricanes are absolutely indifferent to how they develop, where they go, and what effects they have. They play themselves out like an algorithm. Any given hurricane has more in common with a storm blowing across the heat blasted, empty and forlorn wastelands of Mercury than it does to any creature picking its way across a landscape fraught with opportunities for the making of decisions and the exercise of intentional actions. Hurricanes do not care, they simply are. When a hurricane comes into close contact with a city full of human beings there occurs a confrontation between a world of meaning and intentionality on one side and the mute indifference of the laws of nature on the other. The hurricane makes its impact felt physically, in swaths of devastation that reduce the city back to its material elements, back to mere things devoid of context and framework. The hurricane treats the city like an aggregate of stuff, and in doing so, reveals the fact that, on one level, that is all a city ever really is, no matter how much that stuff may actually mean to the individuals who live with it. The photographs of New Orleans in the aftermath of Hurricane Katrina by Robert Polidori in the special exhibit at the Metropolitan Museum of Art are studies in the results of this impact between the indifference of nature and the intentional space of the city. They are incredibly powerful photographs. They show a city reduced to mere things. Perhaps most profoundly, they show the interior spaces of people’s homes as those homes have been instantly transformed into ruins. Bedrooms, living rooms and kitchens that less than two years ago were rich with the contents of human lives look like they are the remnants of a long dead civilization. They look a thousand years old. 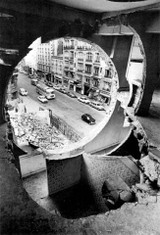 The effect is not unlike the work of the artist Gordon Matta-Clarke, who would, literally, cut through the urban landscape exposing the interiors of houses and other structures and creating what felt like open wounds within the space of the city. The amazing thing about Matta-Clarke’s work was the way that it instantly transformed the most intimate spaces into places that feel like ruins, archeological. In its swath of destruction, Hurricane Katrina achieved something similar within the urban landscape of New Orleans. In my favorite photograph, a white automobile sits in front of a white house. At first glance, it isn’t immediately clear that anything is wrong. But further study shows that the entire area has been under water. Lines of sediment have formed on the exterior of the house showing the different levels of flooding over previous weeks. Those same lines are mirrored on the car, revealing, from the perspective of the photograph, layers of geographical strata that mark the progress of the flooding. The overall effect is to erase the significance of the particular objects in the photograph. The house and the car aren’t really what they are anymore. They have become elements in a more primal geographical story that is about water and wind and dirt and mud. In aggregate, these photographs tell a general story about the transience of human things in the face of cosmic indifference. And oddly, in doing so, they are profoundly beautiful. They are so beautiful that it is disconcerting. In viewing the photos, I began to find myself almost pleased that the hurricane had graced us with these images of human ruin. In one photo, several cars have been upended in the flooding and now lean at angles against a few houses on a block. It is as if they were placed there by Richard Serra. And they are beautiful that way. It is inherently pleasing to look at and to contemplate. Perhaps this is the revenge of the mind against the meaninglessness of the hurricane’s work. The hurricane won. In the course of a few hours it reduced generations of human activity to so much detritus floating in the filthy waters that breached the levees. But in doing so it also revealed a truth, which is that the richness of intentional spaces always contain the seeds of collapse and decay. It is melancholy to reflect that every facet of the urban landscape is also a ruin in potential. But it is no less true for being so. Hurricane Katrina neither knew nor cared that it was beautiful. But Polidori’s photographs have revealed the truth content that, despite itself, the hurricane carried along in its wake. What can be glimpsed in those striking images is the beauty of eking out transient spaces of meaning within the background of the swirl, the decay, within the waiting arms of death and oblivion.